Bayeux, we are told was the first town to be liberated by the Allied Forces in Normandy in 1944. But on our visit today, we’ve come to find out about another war – the Battle of Hastings in 1066. Bayeux is home to the famous Bayeux Tapestry. This 70- metre long embroidery with mythological animals, castles, Viking ships and Norman cavalry offers insights into life in the 11th century and tells the story of William the Conqueror’s invasion of England. 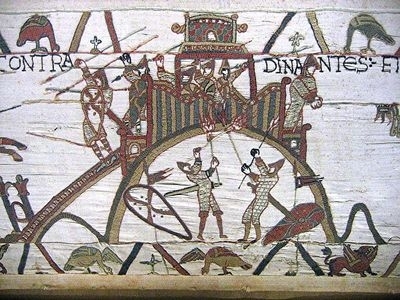 Although there are several theories on the origin of the tapestry, popular belief is that the Bayeux Tapestry was commissioned by Bishop Odo of Bayeux for the consecration of the church. 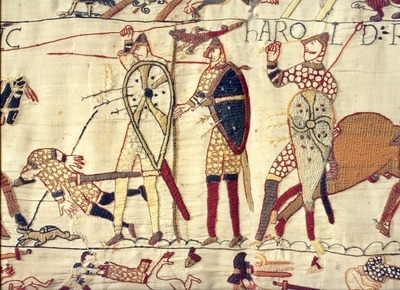 In comic strip-like style, the Tapestry tells the story of William the Conqueror’s invasion of England and the defeat of Harold, King of England, at the Battle of Hastings. The Tapestry contains 58 action-packed scenes. You can tell the English from the French by the moustaches. The English wore wide moustaches whereas the French were clean-shaven. The Tapestry is encased in glass and is protected from light. Visitors are provided with an audio guide which provides commentary on each of the 58 scenes on the Tapestry. This audio guide explanation is great, unfortunately when the Museum is crowded you may have to move along before an explanation is complete. The audio guide is available in 14 languages and they even have a version that’s been adapted for young children and this is available in French and English. This amazing 11th century record of an important battle is certainly worth seeing. The very well-stocked Museum shop sells books, games and DVDs on Bayeux, t-shirts and embroideries, porcelain, leather and textile, jewelry and other souvenirs. Around the central high streets you’ll see a range of attractive 15th-19th century buildings. Bayeux was fortunate not to have suffered any war damage. On the way to the Tapestry Museum you will see the Cathedral Notre-Dame. It stands on grounds where previously a Romanesque church stood. This church was consecrated in 1077 and it is believed that the Bayeux Tapestry was commissioned by Bishop Odo for its consecration. I was seeking a connection to enable ordering from the Bayeux Museum on line. Specifically I was looking for a book depicting all the scenes from the Tapestry. The Bayeux Museum bookshop has a good range of things that you may be interested in. Below is link.